Perched on the flank of an inactive volcano in northwestern Cameroon lies a lake with a dark past. One of only three of its kind on the planet. Its name is Lake Nyos and it contains high levels of carbon dioxide. But this lake is not famous for harmless bubbling mineral water springs. This lake is a killer. of a large wave that scoured the shore and knocked down trees. Lake Nyos sits in the crater of a dormant volcano. 80 kilometers beneath the lake is a pool of hot magma that continually releases carbon dioxide and other gases. These gases travel upward through the earth's crust and get trapped in natural spring water which feeds into the lake. This by itself should not be particularly hazardous, and normally the carbon dioxide would escape harmlessly into the atmosphere. 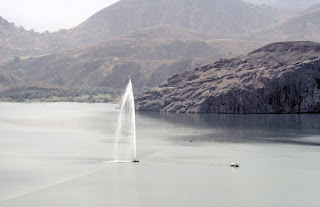 But Lake Nyos is fairly deep, and in the tropics. So the CO2 collects in the cold water at the bottom of the lake. Tropical lakes are typically still and there is not a lot of mixing of their water layers, and Lake Nyos is no exception. Also, the water at the bottom of this lake is cold and under great pressure—ideal conditions for dissolving large quantities of carbon dioxide. The result of this perfect storm is that over time the bottom of the lake becomes saturated with gas. This creates a dangerous situation where the CO2 can spontaneously erupt if there is a disturbance such as a landslide or small earthquake. And while the eruption itself isn't a problem, the suddenly release of carbon dioxide can be very dangerous. CO2 normally makes up only a very small percentage of the atmosphere, only 0.03%, and concentrations of 10% or more can cause suffocation. This all played out on August 21, 1986, when a cloud of carbon dioxide gas suddenly belched out from the lake. Since CO2 is 1.5 times heavier than air, it poured over the rim of the crater and rolled down into the surrounding valley. It's estimated that the lake released 1.6 million tons of carbon dioxide in a cloud 50 meters tall that rushed down the valley for about 23 km, suffocating nearly every living thing in its path. 1,700 villagers and 3,500 livestock living around Lake Nyos were asphyxiated by the deadly cloud. from the bottom of Lake Nyos. In 2001, an international team of scientists, with funding from the U.S. Office of Foreign Disaster Assistance, installed a degassing pipe in the lake in an effort to avoid another disaster. The pipe allows water to be pumped from the bottom of the lake, creating a fountain to release the carbon dioxide harmlessly into the atmosphere. However, more pipes are needed, and the area has since then been repopulated. It may only be a matter of time before this lake strikes again.